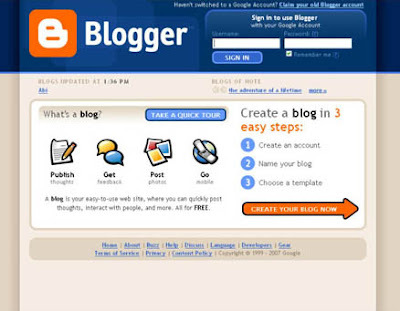 Go to www.blogger.com and click the "Create Your Blog Now" button. 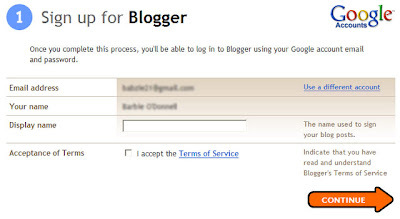 On the following page you'll be prompted to create a Google Account. If you already have a Google Account perhaps from Gmail, Google Groups, or Orkut, click sign in first. On the next page your email address and your name will show based on your Google account. You will need to fill out the Display Name you want viewers to see when they click on your Profile. If you are blogging for your business you might want to use your business name here but your first and last name are also good. If you don't want to share that much information just use your first name. Click next to I accept the Terms of Service and click Continue. The next screen you will see has 2 boxes to fill out - the Blog Title and the Blog URL. The next page will ask you to give your Blog a Title. The title will be the name you want to give your blog like, Business Blogging Guide. 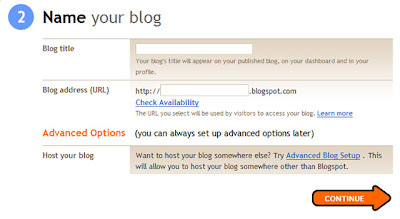 If the name you chose is not available Blogger will show, Sorry, this blog address is not available. In that case try another name or use one of the suggested names. You will want to think carefully about the name you chose. The next box will ask you to type in a Blog address (URL). This will be the address visitor's will use to get to your blog. Scroll through the list of freebie templates and pick one to use by clicking in the round button (called a radio button) next to the name of the template. A template can easily be changed later if you decide you don't like what you chose. You can see what it will look like if you click the Preview Template link at the bottom of each template picture. 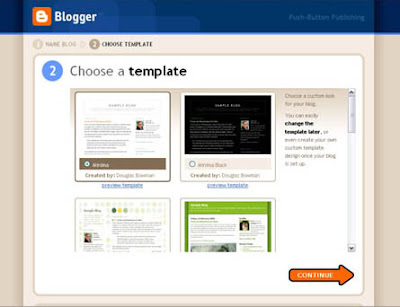 Click Continue after you choose your template and click Starting Blogging.